Everyone knows Cape Cod is a great summer playground. But as Brewster’s expanding off-season tourism proves, the Cape is not just for July and August anymore. Many of the town’s inns and restaurants have extended their season to Christmas; some remain open year-round. And while saltwater swimming may be out of the question in October, Brewster’s museums, antiques shops, nature walks, and bike trails are not. Brewster’s reputation as a seaside retreat dates to the 1800s, when many sea captains bought homes here. A number of their former residences have been turned into inns, including the Candleberry Inn, which is listed on the National Register of Historic Places (1882 Main St., www.candleberryinn.com, 508-896-3300; from $135). The inn is a short walk to the Brewster Store, beaches, and several good restaurants. The nearby Bramble Inn, with its gourmet restaurant and lush garden patio, also is a good choice. (2019 Main St., www.brambleinn.com, 508-896-7644; from $148). Families with young children should try the Old Sea Pines Inn (2553 Main St., www.oldseapinesinn.com, 508-896-6114; from $115). You won’t have any trouble finding top-notch restaurants in town. The small and extremely popular Brewster Fish House (2208 Main St., www.brewsterfish.com, 508-896-7867; dinner entrees from $18) is a former retail fish market whose menu includes native oysters, scallops, and lobster. Go early, as it doesn’t take reservations and the wait for a table can get long. Or eat at the bar. Chillingsworth (2449 Main St., www.chillingsworth.com, 508-896-3640; the Table d’Hote menu in the main restaurant ranges from $60-$75, entrees in the bistro from $17) offers a French restaurant as well as an informal bistro that includes white-clothed tables on an outdoor stone patio. For traditional fried clams and lobster rolls, try JT’s Seafood (2689 Main St., www.jt-seafood.com, 508-896-3355; fish platters from $12.99). El Guapo’s Taqueria (239 Underpass Road, www.elguapostaqueria.com, 508-896-3338; burritos from $6.95) is open for lunch and dinner and is a tasty picnic stop on the Cape Cod Rail Trail. We love the fish tacos, topped with a zingy lime sauce. 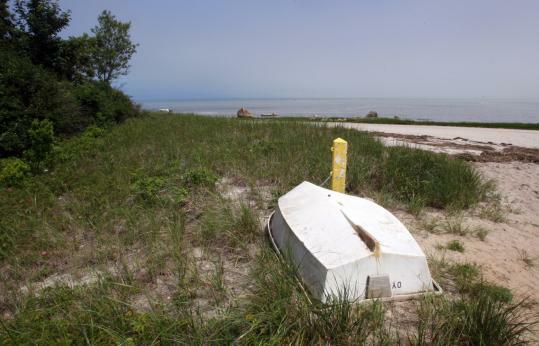 As with most Cape towns, Brewster has lovely beaches — seven public bayside beaches with portable toilets but no lifeguards. (Parking stickers are required in season and are sold at Town Hall). But lots of fun can be had beyond swimming. At low tide, the shoreline is known as “Brewster Flats’’ and stretches out to sea two miles. Kids (and grown-ups) love to watch crabs in the dozens of tidal pools and stroll the sandbars. The Cape Cod Rail Trail (www.mass.gov/dcr/parks/southeast/ccrt.htm), a paved bike path that winds from Dennis to Provincetown, includes a long stretch through Brewster. Rentals are available at shops on Underpass Road and there are several lunch spots along the route. The Cape Cod Museum of Natural History (869 Main St., www.ccmnh.org, 508-896-3867; adults $8, children ages 3-12 $3.50) is a favorite family spot, especially on a rainy day, with its live beehive, tidal pool, aquarium full of crabs, turtles, and frogs, and stunning 1.3 mile Wing Trail through woods and over dunes to the bay. You can hike year-round and rent canoes and kayaks in summer months at Nickerson State Park, (Route 6A, www.mass.gov/dcr/parks/southeast/nick.htm, 508-896-3491) or browse the town’s many antiques shops and art galleries and small but excellent Brewster Book Store (2648 Main St., www.brewsterbookstore.com, 508-896-6543). Summer night life for families centers around the Brewster Store (1935 Main St., www.brewsterstore.com, 508-896-3744) and Brewster Scoop next door. The two-story general store stocks crabbing nets, penny candy, lobster mugs, and other tableware, local jam, seashore books, and Christmas ornaments and is open year-round and until 10 p.m. until Labor Day. People eat their cones on benches out front. If you want a more cultural experience, the Cape Rep Theatre (3299 Main St., www.caperep.org, 508-896-1888) produces shows through December and a children’s series in summer. If you’re already planning for next summer’s getaway, don’t miss a Brewster Whitecaps game in the Cape Cod Baseball League, which has launched many a star, including Red Sox Jason Varitek and Kevin Youkilis.